So you've serached everywhere for those vintage outdoor lighting fixtures you've needed for what seems like forever. Having them would mean that you could complete that outdoor lighting project or repair that broken fixture you've been meaning to fix. Their unique style, set in another time period is what sets these lighting fixtures apart. We're going to look into how you can go about finding the vintage fixtures you've been missing. Sometimes you can find some pretty cool stuff at a garage sale. If you're looking for vintage lighting fixtures, you might even find some nice fixtures that you'll love. If you find a set you like, its best to purchase the whole lot and replace all of your fixtures. That's because it may be difficult to find a specific vintage style fixture to match your existing ones. Estate sales give you an opportunity to get some really nice household items for great deals. Search for estate sales online or locally using your hometown newspaper. Estate sales are often organized to liquidate a deceased person's personal items. You can find the details advertised in the classifieds section of your paper. Don't ever underestimate Craigslist. You will be surprised to see the great stuff people sell on there. You may need to continuously check craigslist to find a set of vintage fixtures you like since craigslist is updated each day with new postings. If you find something you like, make sure the quantity available for sale suits your needs. If the seller is local you may be able to call or email them and schedule a time to see the fixtures before purchasing. You can find some interesting stuff on ebay so searching for vintage outdoor lighting can yield some good results. If you know the style fixture you're looking for, seach ebay using that specific name. If not enter the phrase "vinatage lighting" and see what comes up. What better a place to search for vintage outdoor lighting fixtures then at an antique store? 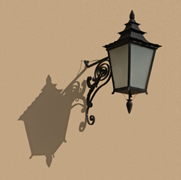 Look for antique outdoor lighting fixtures that you just can't find anywhere else. Antique stores have already gone through the trouble of going to the estate sales, searching craigslist, and ebay. While it's very convenient, you do pay a premium on items purchased at an antique store. If you know exactly which style vintage fixture you need, perform a google search for companies that sell them. Often these companies will manufacture vintage fixtures and sell them. While the fixtures they sell are not originals from that era, they look identical to the originals and can help you get the job done quickly and without delay. Another advantage is that you could rely on these fixtures to be up to date with the latest advancements in lighting technology. So while they look vintage, they perform like newer lighting fixtures.